Riot police flow between the Old Palace and the Serbian Presidential building, heading in the same direction I am. Yesterday was the date of the national day of the former Federal Republic of Yugoslavia (FRY) and I'd been warned at the hostel that there may be some people out marching "because of nostalgia". What kind of nostalgia requires riot police? I continue down the busy main road of Kralja Milana, trying not to let the increasing numbers of riot police worry me; no one else seems to be paying them any attention. Ahead the police have closed off the road and a procession is marching towards the town centre and the bored looking, shield carrying officers. It's a only a small march, perhaps two hundred people waving the plain blue, white and red striped flag of the FRY. In the middle of the column is a flat-bed lorry with a sound system playing a slow heavy marching song, the brass instruments sound harsh through speakers designed for bass heavy beats. With the march in the road, flanked by police, the pavement becomes very crowded, but shoppers carrying on as usual, pushing past each other with bags of food and new clothes. Few seem to be paying attention, only one or two stop and watch the march. Just as I make it past the procession the marching music ebbs and a thumping beat bursts into the air. For ten seconds dance music roars from the speakers on the flat-bed, a folk melody starts to soar over the techno drums, then it all stops. An awkward twenty seconds of silence follows, in which you can imagine a red-faced DJ disabling shuffle on his iPod, before a slow march, overflowing with horns and drums, starts to play and returns the procession to its more serious tone. The large roundabout of Slavija at the southern end of Kralja Milana is packed with stationary traffic, trapped by the police who have closed their escape route because of the march. Every car, bus and motorcycle is honking and beeping at the same time. A cacophony of angry traffic, penned in and champing at their accelerators. 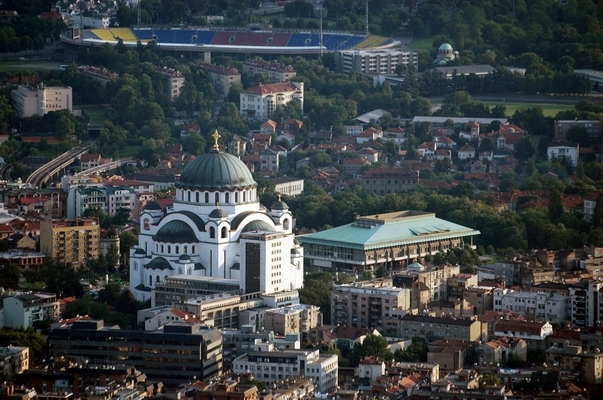 I carry on past and towards the massive dome of the Cathedral of St Sava; reaching seventy meters high and standing clear above the surrounding apartment buildings, its crowning golden cross gleaming. The central space of the cathedral is closed off with Heras fencing; forklifts and cherry-pickers stand between plastic covered piles of building materials. At first I think the cathedral must be in the middle of a huge restoration project, having taken the fabric back to the bare poured concrete. Hang on, poured concrete? Then it dawns on me that the cathedral is, to my amazement, still being built for the first time. I always associate large scale religious building projects has historical events, something that has fallen out of fashion, but the four thousand tonne concrete dome sitting above me is strong evidence that I'm wrong. Given the size and scale of the building I'm filled with a huge sense of ignorance that such a colossal monument is under construction. Looking at the Serbian information signs I manage to decipher that the building works started in 1985. I wander through the small areas that are open, looking at the bare concrete, still shocked by the seemingly anachronistic combination of a timeless building style being assembled using modern technology. In the UK I get the impression that Christianity is very much on the wane, but perhaps the Orthodox church is in a much healthier state, or is this construction a giant swan song? Returning to the Slavija roundabout I see that the traffic has slowly begun to move again. Every small gap that appears is instantly fought over by three different vehicles all eager to throw themselves into the scrum. After a short wait the airport shuttle bus appears and drops off my friend Ste, who's flown out to join me for this section of my trip through Belgrade and Budapest. After an afternoon snack in a smokey cafe Ste and I head through the Kalemegden park in the light rain and dimming light. We wander through the darkening walls of Belgrade Fortress and follow a long row of silent field artillery to the Belgrade Weapons museum. We only have an hour before closing time, but unfazed we start to wander through the exhibitions. Most of the explanatory notes are written in Serbian, but we guide ourselves through the bloody history of the Balkans by the many maps that outline war after war, from the dawn of time until very recently. Each era is accompanied by glass cases of weapons, starting with rusting swords and shields and ending in fragments of an F117 stealth fighter that was shot down over Serbia in 1999. While I had some idea of how complex relations in the Balkans had been, after walking through the museum I've estimated that up by at least a factor of a hundred. In the last room we visit, before we are chased out at closing time by a security guard, has its walls covered in brass plates, inscribed with thousands of names. In the middle of a red carpet stands a statue of Marshall Tito, head tilted down as if in though, his bronze overcoat billowing behind in the instant of his frozen stride. Tito managed to do what no-one before him or after him has been able to do; create a unified southern Slavic state, not always peacefully, and die of natural causes without being overthrown. Given the blood stained clothes of Alexander I of Yugoslavia that he wore on the day of his assassination which are on display two rooms earlier, some might argue that in Balkan politics assassination is considered a natural cause. For dinner Ste and I choose a Lebanese restaurant, where once seated and enjoying our food in the busy atmosphere, a belly dancer starts to pirouette and sashay between the tables. Our British politeness fails us as we are torn between watching her and appreciating the dancing, as she gyrates elegantly up and down the restaurant or deciding it's rude to stare at a scantily clad woman shaking her hips suggestively near your lamb kofta. In the end we take the middle route, as others in the restaurant are doing, and watch her only when she's further away and there's little chance of making eye contact, then to steadfastly ignore her when she's close. Our best find of the evening is a taverna opposite Studenski Trg that is packed with drinkers enjoying an '80s and '90s cover band, to which most people are singing. I'm unused to the cigarette smoke which fills the bar, leaving a dry, bitter taste in my mouth; but my dry tongue is relieved with a sip of one of the relatively sweet local largers served in Belgrade. Ste believes that there's something about the cigarette smoke that adds atmosphere to a night, but I'm not convinced and make a mental note to be thankful for the smoke free atmosphere of a pub when I'm back home.